And the Pacers win with a better looking effort. Bucks lost and Philly loss also tonight. Took care of business beating three bad teams, would have liked a split with Toronto and Boston, but 3-2 on the road trip is acceptable. In our brain fun Guess the Score excersice today I was 118-103, point spread +15. 121 - 106, damn, both teams made one unnecessary and tough three pointer at the end. I'm not Robodoug, but If I wanted to be selfish - one three pointer too many by Knicks stole my glorious place numero uno. J/k, who cares? I expected easy W without defensive struggles on both sides. Now - back home. To get the best record in the NBA before All Star weekend. That would screw up a necessary break in a season for 3 Pacers. Instead vacations on the Islands, Nate, Dipo and Bonis will have to take a part in the public entertainment. BUT, if that will happen, I hope (naive fool), that refs whistle will be less abysmal towards Pacers. We'll see. Good. We needed a game like this one. Our defense looked better for most of the game. It was a good enough game from start to finish for us. We haven't had a good game from start to finish in 2019 yet so I'll happily take this one. Just checked the schedule before the All Stars weekend. 11 games at home, 5 on the road. 5 road games are against MEM, ORL, MIA, WAS and NOP - none of whom have a winning record. Only Miami lately began to play well, now at 20-20. 16 games left, I guess projected record should be 16-0, right? You never now. With someone like Domas, who wants to win EVERY TIME, even such improbability seems possible. Just stay healthy everyone. Pacers don't have much luxury to miss their warriors due to diarrhea or Uber driver using outdated navigation system. 16 games. It will be very interesting to see how the things will unfold. Don't strain yourself too much. To have a good game from start to finish it's like winning lottery. Would be boring if every time one buys a lottery ticket - it's a winning ticket! I'm just messing with you . Nobody likes pot holes on the road but every time we drive, it's a bumpy ride. Last game I listened to Knicks stream, today - ESPN's. There is more and more chatter that Domas could be in the All Star game. Personally - nah, bench guy, doesn't play long minutes. BUT he plays the same if he is on the floor 12 minutes or 40+. Couple years ago I wrote to my buddy - don't be surprised if Domas will make an All Star team. I just thought that in OKC he would be used the way Pacers are using him. He wasn't convinced. Myself, I think that for 3-4 more years Domas game will keep improving. And, in future, some All Star appearances seem quite possible. Domas himself I think doesn't want this to happen this year. He plays 100% all the time, but everyone needs time for recovery. I spent good 15+ years of my life busting my buttt training and competing, the things I liked most were to sleep and to eat. Victor looked like his old self today. Confident, crisp. His rhythm and stamina are returning. Yep. What separates the Great Ones from the others - consistency. Let's pray for that. 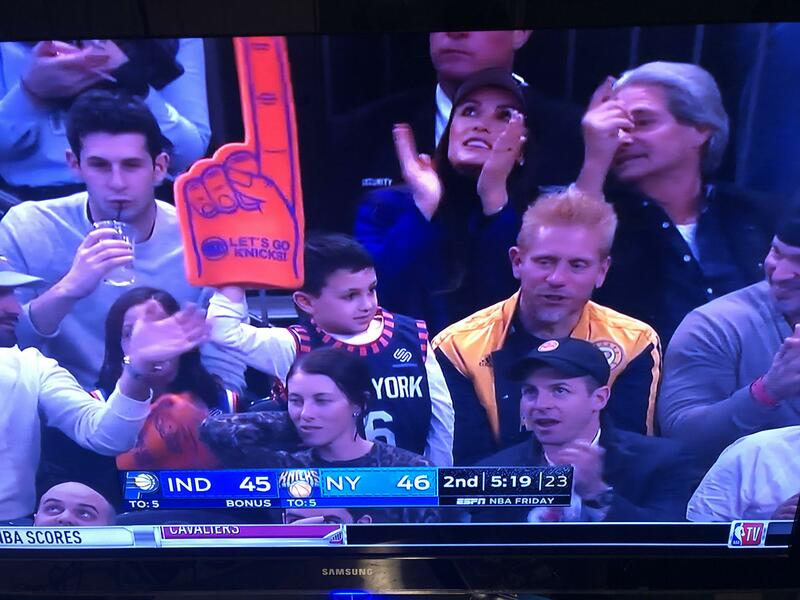 I am guessing that I can be totally off on this and that there is another random Pacers fan in New York that happens to have a goatee and blond spiked hair, but is this our very own NapTown Seth in the Stands in MSG? I haven't seen him in years and seem to recall that Seth was a little thinner, but I had to stop and rewind to see if my eyes were deceiving me. That's what I thought. Naptown Seth is even more famous than we thought. Even showing up on National TV. Super efficient Oladipo, Sabonis is undoubtedly that 2nd scorer we crave on this roster (Just keep those minutes high when Myles comes back) - Nice way to finish the road trip, hopefully we can stay on track for 54 wins. I was glad to see the Pacers play better. 3-2 on a road trip is a good result. Go Pacers.